Packed full of flavor and with an impressive nutrition profile to boot, oyster mushrooms should be a welcomed addition to a healthy nutrition regime. There are many types of oyster mushrooms, which vary slightly in their taste and nutrition content. We’ll focus mainly on king oyster mushrooms and their health benefits in this article. However, some of the studies cited may have been carried out on another variety of oyster mushroom. The preparation methods that we’ll highlight could be used for any type of mushroom. The scientific name for king oyster mushrooms is Pleurotus Eryngii. They are also known as king trumpet mushrooms, French horn mushrooms, king brown mushrooms, boletus of the steppes, trumpet royal and ali’i oyster[i]! As its name might imply, the king oyster mushroom is the largest of all the oyster mushrooms. It grows naturally in the Middle East and North Africa. It is also grown commercially in a number of countries throughout Asia, as well as Italy, South Africa, Australia and the US[ii]. Because king oyster mushrooms provide a decent source of protein, they’re a good addition to a vegan or vegetarian diet. They’re not a complete source of protein so be sure to include a variety of different protein sources in your eating plan if you are vegetarian or vegan. This will help ensure you’re getting all your essential amino acids. King oyster mushrooms can also be considered a low-carb food. At around 5g per 100g they’re suitable for low carb diets such as paleo and keto. Now that you’ve got a good idea about the nutritional content of king oyster mushrooms, let’s take a look at how that transfers over to benefits for health. 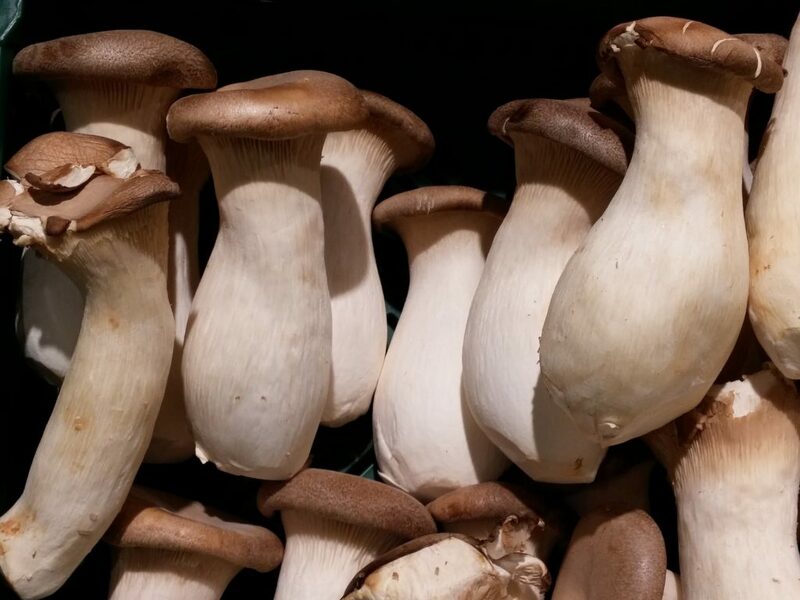 Studies on mice have identified anti-inflammatory properties of oyster mushrooms[v] [vi]. This suggests that they could be a useful inclusion as part of a diet focused on reducing inflammation. Conditions such as arthritis, fibromyalgia, and muscular pain are usually characteristic of misdirected inflammation[vii] and could all potentially benefit from a dietary regime that’s high in anti-inflammatory foods such as oyster mushrooms. Rats have also provided some insight into the potential for oyster mushrooms to help with lowering cholesterol[viii]. In one study, six week old rats with elevated cholesterol were supplemented with king oyster mushrooms. Their total cholesterol, triglycerides, “bad” cholesterol, total lipids and body weight all reduced with the intervention[ix]. These results offer promise for king oyster mushrooms as a cholesterol lowering substance to be used in the human diet. Animal studies have suggested that oyster mushrooms have a notable level of antioxidants[x] and could therefore help to keep body cells healthy. They may also have the potential to “boost” the immune system[xi] and help ward off sickness. Anti-cancer properties are also being uncovered. A study investigating the effects of various types of mushrooms on the growth of breast and colon cancer cells highlighted favorable results with oyster mushrooms. When compared with the effects of portbella, enoki and shitake varieties, oyster mushrooms came out on top. They suppressed the growth of both breast and colon cancer cells more notably than the other varieties of mushrooms[xii]. There is plenty to love about king oyster mushrooms. Not only are they super healthy but they’re also very tasty. Time to get onto figuring out what to do with them! 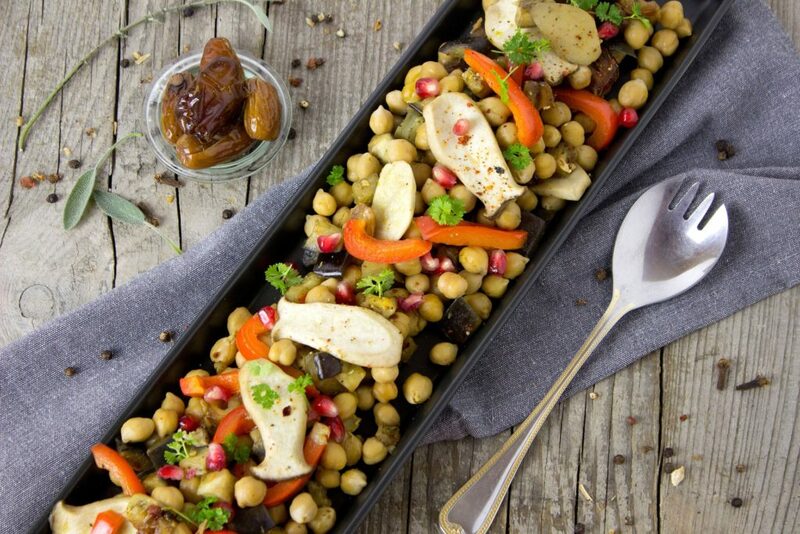 You can use king oyster mushrooms in the same way you’d use any other type of mushroom. They will enhance the flavor of a huge variety of dishes and can be very simple to prepare. When you’re selecting king oyster mushrooms, (or most other types of mushrooms) at the market, choose ones that don’t appear shriveled or slimy. This will help ensure you’re picking the ones that are in their prime for edible goodness. When you’re ready to use your king oyster mushrooms, first cut the bottom off the stems. Some people throw the stem away or save it to use in stocks. However they’re also very useable in many dishes so can just as easily be used in most recipes, unless you’re going for a very specific culinary creation! It’s a very good idea to give your oyster mushrooms a wash before cooking them. This will help remove dirt, dust and bacteria and it shouldn’t affect the cooking process or taste. If you simply rinse them and give them a light scrub if they need it, they’ll only take on a little bit of water. The flavors of the mushroom will still come alive when you cook them. As you can probably gather by now, preparing oyster mushrooms is a very fast and easy process. Roast a tray of them in butter or ghee, your favorite liquid stock, and a sprinkle of salt and pepper. Make sure you’ve got enough liquid to cover the mushrooms. Cook at 425 degrees for 45-50 minutes until the liquid has been soaked up. Serve and enjoy! 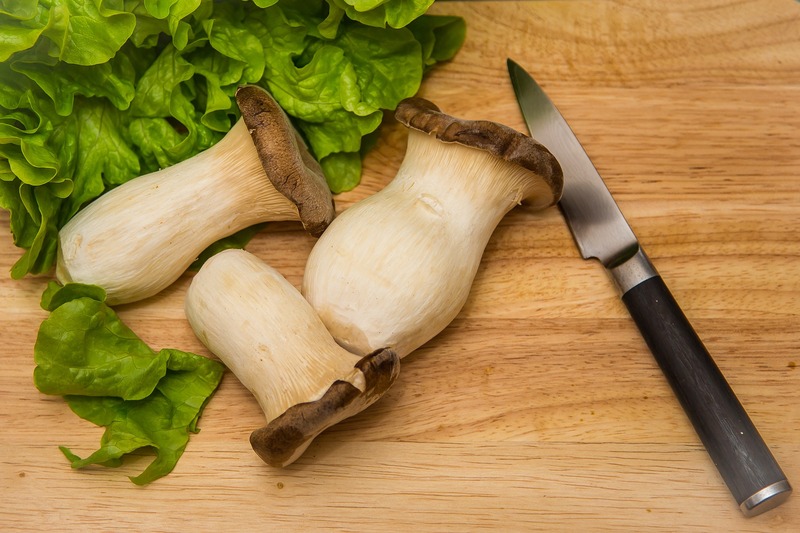 What are your favorite ways to use these delicious and nutritious mushrooms? We’d love to know so please do leave a comment below!